In modern odontology teeth implantation is the most perspective and demanding area. A denture treatment is the best choice when dental filling is impossible and there is absence of one or several teeth. The ENT service includes both diagnostics and treatment, and surgical treatment. Beautiful smile depends not only on dental health, but also on character of their interlocking with each other – bite or occlusion. The possibilities of modern dentistry allow us to solve problems of dental lesions in order to avoid tooth extraction. With the help of orthogenetic surgery, it is possible to correct congenital anomalies of the facial skeleton. In Modern Implant Medicine different kinds of oral surgical procedures are performed with the use of local and general anesthetics. The surgical odontology and maxillofacial surgery are the areas where endoscopy plays an increasing role. A modern dental CT scanner of the latest generation GALILEOS is practiced in the clinic. Do not be afraid, just trust professionals! 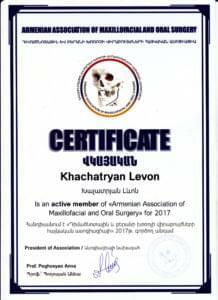 Armenian-German medical center of maxillofacial surgery “Modern Implant Medicine” was founded in 2009 and till 2012 has been functioning in the 3rd Clinical Hospital of Yerevan. The founders of the center are Grigor Khachatryan (scientific director), an assistant professor in Yerevan State Medical University, and Professor Khoury George (scientific consultant, Hamburg, Germany). Since June 2012 the center is functioning in a specially equipped clinic at the following address: 40 Dzorapi st., Yerevan, Armenia. The pride of MIM clinic is the highest class doctors and each of them is the best in his field. We have implantologists, prosthodontist, maxillofacial and plastic surgeons, orthodontists and therapists with long-term experience in premium class clinics. Our specialists regularly attend courses and practical training in Italy, Germany, Spain and other European countries. The best techniques, materials, diagnostic, surgical and dental equipment of the latest generation are the established standard and the basis on which the whole work of the clinic is built. We constantly update and improve the material and technical base, which allows us to confirm our status as one of the best dental and implant clinics in Yerevan. Any office in our clinic has the highest European level, not only in equipping, but also in the environment created for the patients. MIM doctors have individual approach for each patient. In addition, it is very important to know the individual characteristics of the patient in case of the selection of medications. Our doctors pay close attention to any information to determine the optimal treatment method. Dentsply Sirona's Astra Tech dental implants at MIM Medical Center. During the period of 1974-1979 he studied and graduated from the Stomatological Faculty of the Yerevan State Medical Institute. 1979-1980 – Internship at Stomatological Clinic N3 of Yerevan. 1980-1982 – Regional center of Noratus (Kamo) at Medical outpatient department of stomatologists. 1982-1986 – Children Clinical Hospital N4 of Yerevan, Head of Maxillofacial Department. 1986-1991 – Maxillofacial surgeon at Children Clinical Hospital N3 of Yerevan. 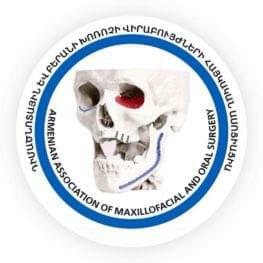 1991-1993 – Maxillofacial surgeon at Children Clinical Hospital N3 of Yerevan. 1993-1999 – Head of Maxillofacial surgery department at the Institute of Surgery after A.Mikayelyan. Starting from 1999 is the Founder and Head of the Center of Maxillofacial, plastic surgery and dental implantology of Yerevan clinical hospital #3 under the YSMU after M.Heratsi. He is also on the position of scientific head of Modern Implant Medicine medical center. 1984 – Moscow research center of Maxillofacial Plastic Surgery. 1986 – completed the course of advanced medical training for heads of departments at the faculty of Surgical Somatology of the Leningrad Institute of Advanced Medical Training. 1996 – Canada, Toronto , “Hospital of Sick Children”. 1998 – Medical practice at Saint Luca University Centers in Marcel, Brussels and Hamburg. Since 1997 he is an acting member of European Association on cranio-maxillofacial surgery, EACMFS. At 1996 awarded Doctor of Medicine degree. The research issue is “Surgical intervention methods choice in combined anomalies of facial cranium during surgical correction”. Dr. Khachatryan also has more than 50 scientific researches. Maxillo-facial surgeon; Doctor of Medicine, Associated professor of the chair of MFS of YSMU after M. Heratsi, Chief maxillo-facial surgeon of Ministry of Health of the RA,founder of maxillo-facial and plastic surgery medical centre Modern Implant Medicine. During the period of 2000-2002- studied at the Prague Medical University. 2002-2005 – studied at the Medical Faculty of the University of Armenian Medical Institute. 2007-2009 – graduated from the Medical Faculty of Armenian Medical Institute. 2009-2012 – passed clinical residency with specialization Maxillofacial Surgery. 2010 – attended courses Medical Center ESTETICA Clinic in Hamburg. 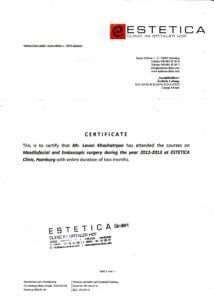 2012 – attended courses in Medical Center ESTETICA Clinic in Hamburg. 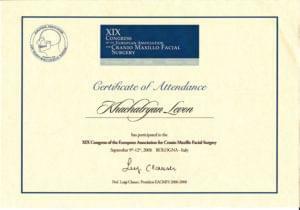 In 2008 – took part in the 19th Congress of the European Association of Maxillofacial and Plastic Surgery, Bologna (Italy). 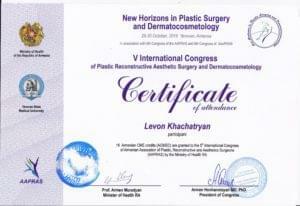 In 2009 took part in the International Congress of Armenian Association of Reconstructive and Esthetic Plastic Surgeons, Yerevan. 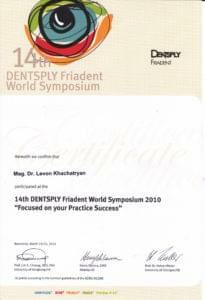 In 2010 took part in the 14th DENTSPLY Friadent World Symposium «Focused on your Practice Success», Barcelona,Spain. In 2010 took part in the 20th Congress of the European Association of Maxillofacial and Plastic Surgery, Bruges (Belgium). 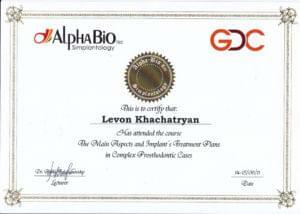 In 2011 participated in the courses organized by Center AlphaBio TECS implantology on”Key aspects of the implants application in case of complex prosthetics”. 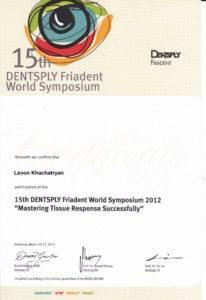 In 2012 took part in the 15th DENTSPLY Friadent World Symposium on «Mastering Tissue Response Successfully», Hamburg. 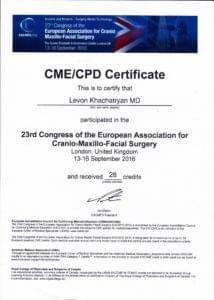 In 2014 took part in the 22rd Congress of the European Association for Cranio-Maxillofacial Surgery, Prague, Czech Republic. In 2016 took part in the 52nd Graz Course on Rhinosurgery, 8th Course on Basics of Septo-Rhinoplasty, Graz, Austria. In 2016 participated in EACMFS XXIII congress, London. 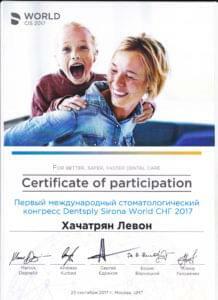 In 2017 took part in DENTSPLY Implant World Summit Tour 2017. 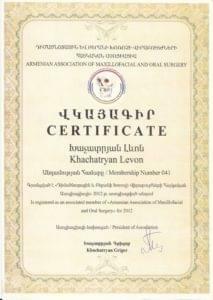 Member of Armenian Association of Maxillofacial and Oral Surgeons. 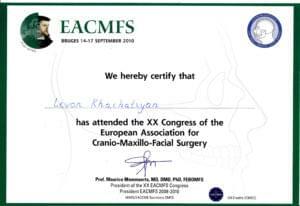 An acting member of European Association on cranio-maxillofacial surgery, EACMFS. Councillor of European Association on cranio-maxillofacial surgery. 1991-1996 – Stomatology Faculty of Yerevan State Medical University. 1996 – 1999 – residency at the Department of Prosthodontics of YSMI. 1999 – 2002 – postgraduate studies at the Department of Prosthodontics at YSMI. 1997 – 2003- Dentist-orthopedist in the Dental Out-Patients Clinic No9. 2005 – «CBW-minimally invasive system», IC «8 microns», Moscow. 2003 – 2014 – dentist at the Dental Orthopedic Centre ULTRA-DENT. From 2010 till now a dentist at Medical Center “Modern Implant Medicine”. 2010 – Medical Center ESTETICA Clinic in Hamburg. 2012 – Medical Center ESTETICA Clinic in Hamburg. Author of eight scientific papers. Dental orthopedist at Medical Center “Modern Implant Medicine”. 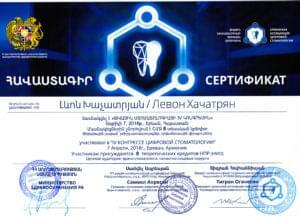 2002-2007- graduated from the Dental Department of the Yerevan State Medical University after Mkhitar Heratsi. 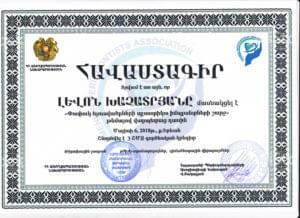 2007-2009 graduated from the Family Dentistry Department of the Yerevan State Medical University after Mkhitar Heratsi. 2007-2009 -dentist at the Gental-Dental Clinic. 2009-2011-dentist at the Arpine-dent Clinic. 2011-2015-dentist at the Yuva-dent Clinic. 2013-2015- dentist at the Donimano clinic. 2015- dentist at Medical Center “Modern Implant Medicine”. 2012- Attended the course of recognition commitment to continuing educational development for better dentistry. 2013- Specialist training course for the use of CRM technology. 2014- Attended the course of In recognition commitment to continuing educational development for better dentistry. 2015- Attended International Seminar CRM and HYCORP technologies in Contour Plastic. 2015- Attended the course of Plasmolifting in Dentistry. 2016- training by Dr. Julian Webber, “The Perfection of Endodontie”. 2016- Attended the course of Practical Nuances of Endodontie. 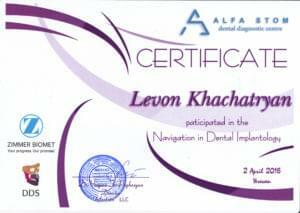 2016- Attended the course of Navigation in Dental implantology. 2017- Attended the course of Creating a Functional Aesthetics Frontal and Dental Group of Teeth. 2017- Attended the course of the world of aesthetics and restorations. 2017- Basis of clinical implantology 3D diagnostics in dental practice. 2018- Attended the international endodontic Congress. 2018- Participated in the 4th Digital Stomatology Congress. 1989-1992- All Union Scientific Centre of Surgery, Department of Plastic and Reconstructive Microsurgery, correspondence postgraduate study, Moscow, Russia. 1985-1987- Yerevan branch of All Union Scientific Centre of Surgery, Department of Microsurgery, Resident. 1979-1985- Yerevan State Medical Institute, MD (Honours degree). 2013- 21st Stuttgart Advanced Course for Functional & Aesthetic Rhinoplasty, Stuttgart, Germany. 2008- 16th Advanced Course for Functional & Aesthetic Rhinoplasty, Stuttgart, Germany. 2007- 15th Advanced Course for Functional & Aesthetic Rhinoplasty, Stuttgart, Germany. 2005- Intensive Course of Plastic & Reconstructive Surgery: Surgical Face Rejuvenation, Rhinoplasty, Otoplasty, Moscow, Russia. 2004- Intensive Course of Plastic & Reconstructive Surgery: Rhinoplasty, Augmentation Mammoplasty, Liposuction, Reconstruction of the Breast, Surgical Face Rejuvenation, Moscow, Russia. 1992- Training in the Plastic, Aesthetic & Reconstructive Surgery Department of Forarlberg Land Hospital, Feldkirch, Austria. 1987- Postgraduate Training Course in Microsurgery, Department of Microsurgery, All Union Institute of Doctors Training, Moscow, Russia. 2002-2007- graduated from Novgorod State Medical University. 2007-2008- finished residency of Novgorod State Medical University. 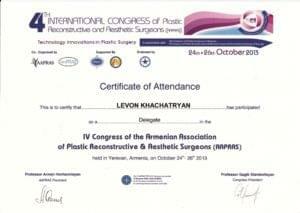 2008 -2011 – graduated from residency in maxillofacial surgery at the Yerevan State Medical University after M. Heratsi. Maxillofacial surgeon of Medical Center “Modern Implant Medicine”. 2009- Graduated from the Aibusak Institute with a specialty in general therapy. 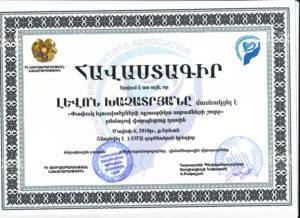 2011- Graduated from the National Institute of Health after academician S. Avdalbekyan in the specialty of anesthesiology and resuscitation. 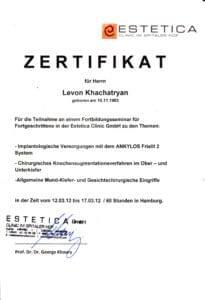 Since 2012 – Anesthesiologist of the Medical Center “Modern Implant Medicine”. 2001-2006 – graduated from the Yerevan State Medical University. Mkhitar Heratsi. 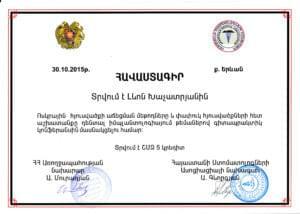 Since 2015, the degree of the Department of Pediatric Dentistry and Orthodontics of Yerevan State Medical University. Mkhitar Heratsi. 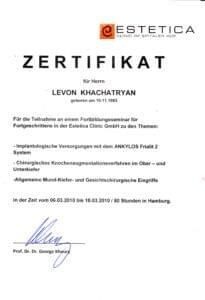 2009-2011 – graduated from the specialty “Clinical Surgeon-Orthodontics”. 2015 – trained in the Czech Republic and the Republic of Poland. 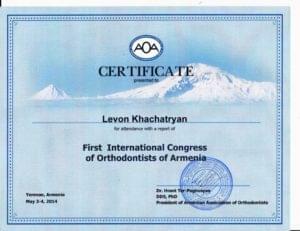 Member of the Armenian Orthodontists Association. 1994-2000- YSMU after Mkhitar Heratsi, Faculty of Medicine. 2000-2003-Clinical Residency on the specialty of Otorhinolaryngology on the basis of NIH MH RA. 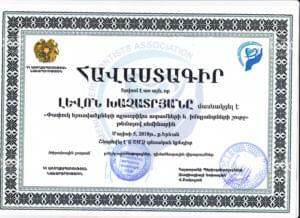 Since 2007 Assistant of the Department of Otorhinolaryngology YSMUafter Mkhitar Heratsi. 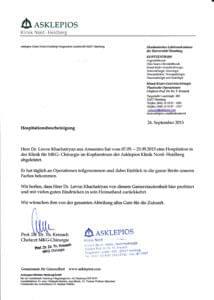 2010 – Internship in Germany on regenerative cryotherapy, cryologist-otorhinolaryngologist. 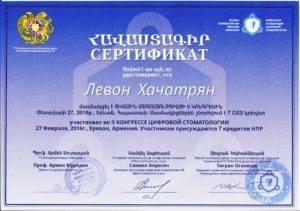 2011 – awarded a diploma of gratitude from the Church of St. Grigor Lusavorich of Sisian (Syunik Diocese). Since 2011– Full member (academician) of the European Academy of Natural Sciences; awarded the Robert Koch Medal. 2003-2015– ENT-surgeon in the Aramyants hospital. 2015– Internship at the Institute after Sverzhevsky on phoniatrics, microsurgery of the larynx. Since 2015– ENT surgeon, doctor phoniatrist in Medical Center “Modern Implant Medicine”. In a modern odontology and a prosthetic repair teeth implantation is the most perspective, relevant and demanding area. It is the technology of implantation of a titanic hinge in a bone tissue with the subsequent installation of a crown successfully practiced in MIM for about twenty years. We have got nearly twenty years’ experience in dental implantology. The major surgical services provided by the center are surgeries in complicated cases of atrophy of alveolar processes and dental implantation at flap surgeries (implant placement with iliac crest, shoulder and fibula bone flaps). Implantologic treatment algorithms have been developed for patients with diabetes mellitus and hypertensive disease. Auto and allogeneic transplants of Sandwich, Sinuslift, Transzygomatic, Transtuberal technique, nerve transposition of n.alveolaris inferior, implant placement for support of complex maxillofacial prostheses are also practiced. A single stage method of immediate prosthetics is also used. Ankylos C/X, XiVE and Astra Tech implant placement gives excellent functional and aesthetic results. In the medical Center, there are all conditions for conducting implantation under general anesthesia or I/V sedation. A denture treatment is the best choice when dental filling is impossible and there is absence of one or several teeth. The type of denture treatment is selected individually for each patient and depends on extent of destruction of tooth, references of the doctor and the patient’s wishes. Denture treatment is possible with removable and non-removable prostheses. For a proper selection of treatment methods, a complete mutual understanding between the patient and the doctor is extremely important. “MIM” medical center offers a full range of services for dental prosthetics: removable, non-removable and micro prosthetics. Installation of ceramic-metal crowns allows to restore chewing function and to give to teeth an original form in case of appreciable destruction. Ceramic-metal crowns consist of 2 layers: internal — metal and external — ceramic. The external layer imitates tooth enamel, therefore the result will be almost indistinguishable from natural. Crowns made of zirconium dioxide are highly durable, do not cause allergic reactions and retain an aesthetic appearance up to 20 years. Frame structures made of zirconium dioxide are distinguished by transparency, so it becomes possible to achieve the most natural result. All-ceramic crowns are made without the use of a metal frame. Aesthetic characteristics include gloss, texture, color, transparency, which completely repeat the characteristics of a natural tooth. Ceramic crowns have the long term of use, don’t change color under the influence of the painting nutritional supplements. Prosthetics with the establishment of bridges are applicable when several adjacent teeth are lost. The construction represents crowns which are bridged with each other. Patient’s own teeth or dental implants serve as a support for the bridge. Installation of veneers and lumineers refers to micro-prosthetics. For the installation of veneers insignificant preparing of enamel is required so the veneers do not increase the teeth and look as natural as possible. Veneers have a thickness that does not exceed 0.3 mm, and their gluing does not require teeth grinding. Fastening is made on the front surface of the teeth. For production of veneers are used materials that repeat the appearance and properties of tooth enamel. hiding of a fluorosis, enamel hypoplasia. Installation of removable prostheses — the ideal decision at partial or full loss of teeth by the patient when installation of implants is impossible. Removable prosthetic is a carcass that is placed in the oral cavity. It includes artificial gums, teeth and supporting elements. If necessary, the carcass can be easily removed. Plastic surgery is the most appropriate solution in cases of age-related changes, congenital deformities and injuries of the maxillofacial area. Rhinoplasty is one of the most common and at the same time difficult areas of facial plastic surgery. Operation allows to improve an aesthetics of a nose and to solve a number of questions of medical character which concern the patient and exert negative impact on his physical and psycho-emotional state. In modern society a rhinoplasty mainly is referred to the solution of aesthetic character problems. The most common problems are individual features of the nose structure. Surgery can be also recommended on medical indications. The most widespread is difficulty of nasal respiration owing to a curvature of a nasal septum. Regardless of etymology, complications associated with this condition can affect the general well-being of a person, cause more serious diseases, and cause chronic inflammatory processes. The bent septum from the birth affects formation of a cartilaginous and bone tissue, deforming a nose. The success of the operation depends not only on the skill of the surgeon, but also on the patience of the patient. The best rhinoplasty is the result of mutual efforts. It is the art of obtaining the desired shape of the nose while preserving or restoring its natural functions. Correction of the skin around the eyes due to age-related changes and pathology is possible through aesthetic surgery. Blepharoplasty is the plastic surgery allowing to give expressiveness to eyes, to create a beautiful section of eyes and also to solve age problems: to remove excesses of a skin and "bags" in the upper and lower eyelids. In recent years, has increased the number of operations which goal is not so much to rejuvenate, but to improve the aesthetics of the orbital zone. They include change of provision of cords of upper eyelids, and Europeanization of eyes, modelling of a form of a palpebral fissure, change of height of a lateral angle of an eye. The operation gives person an open view, the face becomes fresh and young, and the self -confident, beautiful and happy. The shape of the chin has a great influence on the overall perception of the face and neck area. Genioplasty is an operation of facial plastic surgery aimed at eliminating congenital or acquired defects in the chin area, changing the size and improving the shape of the chin. The main purpose of which is to create harmonious proportions between the chin and other parts of the facial skeleton. A series of patients have more expressed defect of chin area with signs of asymmetry and deformation. Genioplasty can be also performed in case the absence of obvious deformities and malformations of the development of the lower jaw bone. In this case, the indication for genioplasty is patient’s dissatisfaction with the appearance. During the operation, the surgeon recreates the anatomically correct outlines of the chin, taking into account the individual features of the facial skeleton. The main goal of the operation is not simply to eliminate deformities and cosmetic defects, but to recreate harmony between the face and the chin area. In certain cases a separate surgery can not fully provide the desired aesthetic result. In addition, at insignificant deformations of different parts of the face, elimination of one of them can lead to a larger expression of other deformations. In such cases, our specialists perform combined surgeries. The most common applied example of the combined surgery is the genio-rhinoplasty which allows to eliminate deformations f the middle and lower third of the face, and recreate a harmonious profile of the person. Besides, in our clinic are performed combined surgeries such as: otoblefaroplasty, otorinoplasty, etc. Otoplasty — the section of reconstructive and aesthetic medicine. The otoplasty unites to the plastic surgeries referred on correction of a form of an ear, its size and position, eliminating congenital and acquired defects. Otoplasty is performed at any age; the main indication for surgery is a person's desire to correct an external cosmetic defect that leads to the formation of internal complexes and causes psychological discomfort. From the standpoint of indications for the operation there are aesthetic and reconstructive plastic of the ears. Aesthetic is used to correct cosmetic deficiencies that cause physical or psychological discomfort. Reconstructive otoplasty combines operations aimed at the full or partial reconstruction of the auricle after injuries and illnesses. Contour plastic allows restoring posttraumatic defects of the facial skeleton, as well as adjusting facial features with the help of alloplastic materials. The implant of the zygomatic bone (Medpor Surgical Implant) helps to have high and impressive cheekbones and more symmetric facial parameters. The increase in the cheekbones elevates the cheeks, greatly improving the contour of the lower third of the face, especially when there are age-related changes. As a rule, correction of the cheek area is carried out to eliminate congenital and post-traumatic deformities. The ENT service in MIM includes as diagnostics and treatment of patients in the ambulatory conditions, and surgical treatment of the majority of ENT pathologies in stationary conditions. Outpatient appointment is conducted in ENT-office, equipped with modern advanced medical equipment that is necessary in proving of qualified ENT-care, including proper diagnostic and effective treatment of diseases of ENT organs. The basis of the cabinet is the ENT-combine, which has all the advanced capabilities. ENT-combine is equipped with sources of cold light for endoscopes, sprayers for dosage forms, disinfectant containers, the high-performance vacuum device. Endoscopic examination of ENT organs is made with Karl Storz (Germany) video endoscopes in video mode, if necessary, an additional endoscopic biopsy can be made. All of the above video endoscopic examinations and manipulations are archived on discs stored in databases and the interested frames are printed and provided to patients. Audiologic examination of patients is carried out with the help of tympanometer, allowing to provide audiometry air and bone conduction. The device of ENT-surgical ultrasonic “LORA-DON” is intended for ultrasonic disintegration (destruction) of pathologically changed tissues of ENT organs (rhinitis, tonsillitis). For the first time in Armenia in MIM Center video stroboscopy is carried out, which is an absolutely indispensable method for examining the vocal apparatus, which allows detecting both organic and functional lesions of the larynx. For physiotherapeutic restoration of voice disorders in the MIM, the method of myostimulation of the muscles of the speech apparatus is used with the help of the VocaStim therapeutic complex. while chewing some teeth of both jaws do not reach each other. In case of noticing at least one of the above signs, you need to contact the orthodontist. Depending on the nature of the available disturbances the doctor selects a treatment method. In some cases, when the proportions of the jaws are too broken or a deep distal bite is observed, orthognathic surgery may be recommended. More often the bite is corrected by systems of long wearing or removable systems. The medical center uses the products of ORMCO, DENTAURUM and AMERICAN ORTHODONTICS. The possibilities of modern dentistry, adopted by our Medical Center, allow us to solve the most difficult problems of dental lesions in order to avoid tooth extraction. In most cases, patients seek dental treatment on rather neglected stages of caries or when severe pain occurs, that’s why, dental treatment in our clinic, is always performed by us using the most effective painkillers, especially in cases of penetration into the root canals. Due to the variety of filling materials, it becomes possible to perform qualified dental treatment with complete restoration of their original form and basic functions of the tooth. Such therapeutic treatment includes the restoration of tooth at a stage where there is still no need in crowns installation, bridges or implants. Professional oral hygiene is an important and integral part of any dental treatment, as well as the part of teeth and gums care in general. Dentists recommend to carry out professional hygiene at least 2 times a year. The procedure is the removal of plaque, which accumulates on the teeth due to many factors. Unsatisfactory daily hygiene, strong tea, coffee, smoking lead to the formation of plaque and tartar. If you do not pay proper attention to hygiene, bacteria can cause many dental diseases. Periodontists and hygienists of our Center conduct professional hygiene in medical and preventive purposes using certified European methods. A snow-white smile evokes the sympathy of others, attracts attention and improves the quality of life in general. Initially, teeth do not have a perfect white color. If they are healthy, then it will have rather yellowish or grayish shade. Moreover, teeth are inclined to darkening because of the use of various nutrition, the painted drinks and a nicotine. Тhe esthetic odontology hurries to the aid of the shining smile. As the main ones there are home and office (professional) chemical bleaching. The most common method is chemical teeth whitening at home. It is conducted under the supervision of a doctor both at the home and in the medical center. Anomalies of the occlusion are changes in the shape of the dental arch and the relative position of the dentition, in which one or more of the proper bite criteria is missing. The bite anomalies lead to aesthetic, psychological and medical problems. Due to improper closing of the teeth, chewing and swallowing of food is impaired. The risk of developing the pathology of the digestive system increases. Many patients experience difficulties with an articulation (pronunciation of the speech). In case of occlusion anomalies dysfunction of a temporal and mandibular joint with a pain syndrome and frequent headaches are typical. Correction of bite anomalies is performed with the help of orthogenetic surgery and conservative orthodontics methods, as well as their alternation or combination. The problems solved by orthogenetic surgery are correction of the bite pathology, restoration of normal occlusion of the dentition, elimination of functional disorders and improvement of aesthetic parameters of the face. With the help of orthogenetic surgery, it is possible to correct congenital anomalies of the facial skeleton, developmental disorders that were formed in childhood, posttraumatic deformities of the upper and lower jaw, as well as defects in the bones of the facial skeleton after reconstructive operations. One of the main tasks of orthogenetic surgery is the reconstruction of the natural aesthetics of the face. During the operation, the surgeon corrects asymmetries and deformities, improves the proportions of the facial skeleton. Changes in appearance have a positive effect on the psychological state, self-esteem and the person’s attitude to life. All functional disorders are also eliminated. Restoring proper occlusion of teeth improves diction, normalizes chewing and swallowing of food, prevents the development of dental pathology and diseases of the digestive system. In Modern Implant Medicine different kinds of oral surgical procedures are performed with the use of local and general anesthetics (operations for diagnostic purposes, impacted tooth extraction, cystectomy reconstructive surgeries of bone tissue with application of osteoplastic materials - PRF(fibrin enriched with thrombocytes). PRF is an auto matrix obtained from the concentrate of the patient’s blood thrombocytes. It is simplified procedure of obtaining fibrin membrane without losing its potential to stimulate bone and soft tissue growth. The “MIM” clinic is equipped with the modern endoscopic equipment of the well-known KARL STORZ company. The surgical odontology and maxillofacial surgery are the areas where endoscopy plays an increasing role. The tools developed by KARL STORZ already allow us to perform a number of minimally invasive endoscopic operations, such as: endoscopic treatment of salivary duct disease arthroscopy and operations of the temporomandibular joint endoscopically assisted operations of maxillofacial area endoscopic surgery of paranasal sinuses. Pathology of a temporal and temporomandibular joint (TMJ) holds a specific place among diseases of maxillofacial area. Despite prevalence, nowadays those diseases represent one of the most difficult and unstudied sections of pathology of the person. The arthroscopy of a TMJ allows to combine at the same time diagnostics and treatment of diseases and taking into account the found changes in a joint to choose optimum tactics of further treatment. By means of an arthroscopy of a joint the nature of pathology is specified, the biopsy and various intra joint manipulations can be made. Methods of arthroscopic treatment of diseases developed in the medical center MIM, with experts from San Carlos hospital (Madrid, Spain) are a new word in treatment of this pathology. Thanks to opportunities of modern endoscopic surgery, the maxillary sinusotomy which already quite widely entered world practice is successfully used at any options of a sinusitis. Now in the medical center MIM all methods of sanation of a maxillary sinus are applied. The advantages of endoscopic maxillary sinus surgery are minimal injuries and quick rehabilitation. A modern dental CT scanner of the latest generation GALILEOS Comfort BRAND- Sirona is practiced in the clinic. The tomography captures 500 different X-ray images in 14 seconds of scanning. Due to the impulse beam exposure time is only 3-6 seconds, as a result of which radiation dosage is the lowest, significantly lower as compared to the somatic (body) tomography. you have to endure a lengthy procedure (up to 3 hours). Don’t be afraid of anything, just trust professionals!